This book locates older people as major clients of occupational therapy services. It provides a comprehensive resource for students and a basic working reference for clinicians. 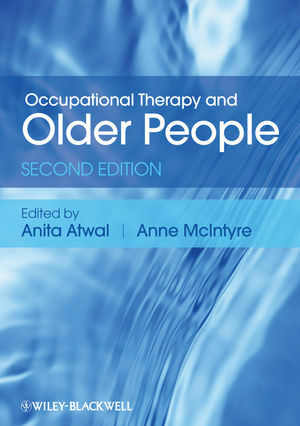 The book encompasses current theories, debates and challenges which occupational therapists need to engage in if they are to provide pro-active and promotional approaches to ageing. Detailed coverage of bodily structures, functions and pathologies leads onto chapters dedicated to activity, occupation and participation. The ethos of the book is to inspire innovation in the practice of occupational therapy with older people, promoting successful ageing that entails control and empowerment. This new edition has been fully revised and updated. In addition brand new material has been included on occupational transitions (retirement, frailty and end of life); user perspectives; public health including advocacy, enablement and empowerment; people entering old age with disability and mental health conditions; visual impairment; assistive technology driving and ageism. Anita is a senior lecturer in occupational therapy at Brunel University. Prior to her academic career Anita’s practice experience was in acute medicine, older people and neurology. Anita has continued her particular interest in older adults in the acute care setting into her academic career and has published over 30 articles in international and national peer-reviewed journals. Anita is the director for Professional Practice Research at Brunel University, which aims to support and empower students, academics, clinicians and service users to promote high standards in clinical practice. She also leads a master’s level module on evidence-based practice for occupational therapists. Anne is currently programme lead for the MSc (pre-registration) Occupational Therapy course at Brunel University, where she has been an OT lecturer since 1997. She teaches occupational therapy and physiotherapy students at undergraduate and postgraduate level. Anne has worked in acute health care, neurological rehabilitation, with children with motor disorders and in community rehabilitation with older people. Anne has also continued her particular interest in older people into her academic career. She leads a master’s level module on occupational therapy and active ageing. She is a member of the Brunel Institute for Ageing Studies.